Our newest dev log video introduces our modular system for vehicle series which enables us to create a multitude of variations of a model series while keeping the needed video memory low. 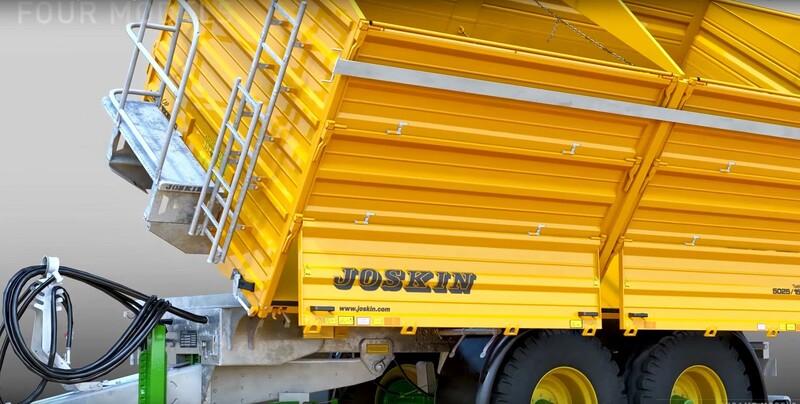 As an example, take a look at the Joskin Delta-CAP series (5025/12DR100 through 5525/16DR120 with a capacity of 12.1 through 15.97 m³). The video shows finished ingame models (except for the separate lights) while the video itself has been rendered in Blender. What’s new in the development section? Our performance optimizations have yielded very good results. We could even more than double the frame rates in critical areas such as displaying a huge amount of objects. Simultaneously we’ve been able to fix a large pile of bugs. We’re continuing to optimize the tutorials, such as the ones for fruit transport, field work, animal feeding and the biogas plant. The employees have received improved driving skills: turn maneuvers perform better, complex chains of drivers on the field are in their final stages, and repeating tasks can now be assigned. Looking ahead, we’d like to give you an accurate and detailed insight into the development. For that purpose we’re building a roadmap section on our website that’ll list most game functions, vehicles and features including their respective progress status. At the same time we’ll specify which game elements will be available at the start of the Early Access phase, and which features will be added during that phase or will be included with the release version of the game.